is an Eastern Orthodox scholar of religion, and a philosopher, writer and cultural commentator. He is an associate at the Notre Dame Institute for Advanced Study, and his latest book is The New Testament: A Translation (2017). He lives in South Bend, Indiana. This past year, I burdened the English-speaking world with my very own translation of the New Testament – a project that I undertook at the behest of my editor at Yale University Press, but that I agreed to almost in the instant that it was proposed. I had long contemplated attempting a ‘subversively literal’ rendering of the text. Over the years, I had become disenchanted with almost all the standard translations available, and especially with modern versions produced by large committees of scholars, many of whom (it seems to me) have been predisposed by inherited theological habits to see things in the text that are not really there, and to fail to notice other things that most definitely are. Committees are bland affairs, and tend to reinforce our expectations; but the world of late antiquity is so remote from our own that it is almost never what we expect. Ask, for instance, the average American Christian – say, some genial Presbyterian who attends church regularly and owns a New International Version of the Bible – what gospel the Apostle Paul preached. The reply will fall along predictable lines: human beings, bearing the guilt of original sin and destined for eternal hell, cannot save themselves through good deeds, or make themselves acceptable to God; yet God, in his mercy, sent the eternal Son to offer himself up for our sins, and the righteousness of Christ has been graciously imputed or imparted to all who have faith. Some details might vary, but not the basic story. And, admittedly, much of the tale’s language is reminiscent of terms used by Paul, at least as filtered through certain conventional translations; but it is a fantasy. It presumes elements of later Christian belief absent from Paul’s own writings. Some of these (like the idea that humans are born damnably guilty in God’s eyes, or that good deeds are not required for salvation) arise from a history of misleading translations. Others (like the concept of an eternal hell of conscious torment) are entirely imagined, attributed to Paul on the basis of some mistaken picture of what the New Testament as a whole teaches. Paul’s actual teachings, however, as taken directly from the Greek of his letters, emphasise neither original guilt nor imputed righteousness (he believed in neither), but rather the overthrow of bad angels. 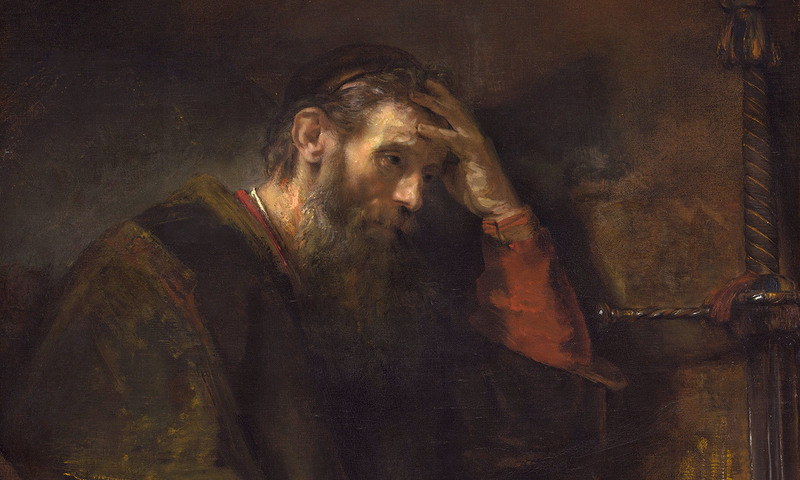 A certain long history of misreadings – especially of the Letter to the Romans – has created an impression of Paul’s theological concerns so entirely alien to his conceptual world that the real Paul occupies scarcely any place at all in Christian memory. It is true that he addresses issues of ‘righteousness’ or ‘justice’, and asserts that this is available to us only through the virtue of pistis – ‘faith’ or ‘trust’ or even ‘fidelity’. But for Paul, pistis largely consists in works of obedience to God and love of others. The only erga, ‘works’, which he is anxious to claim make no contribution to personal sanctity, are certain ‘ritual observances’ of the Law of Moses, such as circumcision or kosher dietary laws. This, though, means that the separation between Jews and gentiles has been annulled in Christ, opening salvation to all peoples; it does not mean (as Paul fears some might imagine) that God has abandoned his covenant with Israel. Questions of law and righteousness, however, are secondary concerns. The essence of Paul’s theology is something far stranger, and unfolds on a far vaster scale. For Paul, the present world-age is rapidly passing, while another world-age differing from the former in every dimension – heavenly or terrestrial, spiritual or physical – is already dawning. The story of salvation concerns the entire cosmos; and it is a story of invasion, conquest, spoliation and triumph. For Paul, the cosmos has been enslaved to death, both by our sin and by the malign governance of those ‘angelic’ or ‘daemonian’ agencies who reign over the earth from the heavens, and who hold spirits in thrall below the earth. These angelic beings, these Archons, whom Paul calls Thrones and Powers and Dominations and Spiritual Forces of Evil in the High Places, are the gods of the nations. In the Letter to the Galatians, he even hints that the angel of the Lord who rules over Israel might be one of their number. Whether fallen, or mutinous, or merely incompetent, these beings stand intractably between us and God. But Christ has conquered them all. In descending to Hades and ascending again through the heavens, Christ has vanquished all the Powers below and above that separate us from the love of God, taking them captive in a kind of triumphal procession. All that now remains is the final consummation of the present age, when Christ will appear in his full glory as cosmic conqueror, having ‘subordinated’ (hypetaxen) all the cosmic powers to himself – literally, having properly ‘ordered’ them ‘under’ himself – and will then return this whole reclaimed empire to his Father. God himself, rather than wicked or inept spiritual intermediaries, will rule the cosmos directly. Sometimes, Paul speaks as if some human beings will perish along with the present age, and sometimes as if all human beings will finally be saved. He never speaks of some hell for the torment of unregenerate souls. The new age, moreover – when creation will be glorified and transformed into God’s kingdom – will be an age of ‘spirit’ rather than ‘flesh’. For Paul, these are two antithetical principles of creaturely existence, though most translations misrepresent the antithesis as a mere contrast between God’s ‘spirit’ and human perversity. But Paul is quite explicit: ‘Flesh and blood cannot inherit the Kingdom.’ Neither can psychē, ‘soul’, the life-principle or anima that gives life to perishable flesh. In the age to come, the ‘psychical body’, the ‘ensouled’ or ‘animal’ way of life, will be replaced by a ‘spiritual body’, beyond the reach of death – though, again, conventional translations usually obscure this by speaking of the former, vaguely, as a ‘natural body’. Paul’s voice, I hasten to add, is hardly an eccentric one. John’s Gospel too, for instance, tells of the divine saviour who comes ‘from above’, descending from God’s realm into this cosmos, overthrowing its reigning Archon, bringing God’s light into the darkness of our captivity, and ‘dragging’ everyone to himself. And, in varying registers, so do most of the texts of the New Testament. As I say, it is a conceptual world very remote from our own. And yet it would be foolish to try to judge the gospel’s spiritual claims by how plausible we find the cosmology that accompanies them. For one thing, the ancient picture of reality might be in many significant respects more accurate than ours. And it would surely be a category error to assume that the story of Christ’s overthrow of death and sin cannot express a truth that transcends the historical and cultural conditions in which it was first told. But, before we decide anything at all about that story, we must first recover it from the very different stories that we so frequently tell in its place. This Idea was made possible through the support of a grant from Templeton Religion Trust to Aeon. The opinions expressed in this publication are those of the author(s) and do not necessarily reflect the views of Templeton Religion Trust.